The Organic Debate: Is Eating Organic Food Really Better? Do you eat organic? Have you found yourself standing in the organic section asking yourself if it’s really worth it? You are not the only one. Once only seen in health food stores, organic products are now found in almost all conventional grocery stores. From fruits and veggies, meats and dairy, to crackers, cereals and sauces, there are tons of products on the market that are now being sold as organic. But what does this term actually mean? According to The Department for Agriculture and Rural Affairs, organic refers to the way agricultural products are grown and processed, using environmentally and animal friendly farming methods, avoiding the use of man-made fertilizers, pesticides; growth regulators and livestock feed additives. 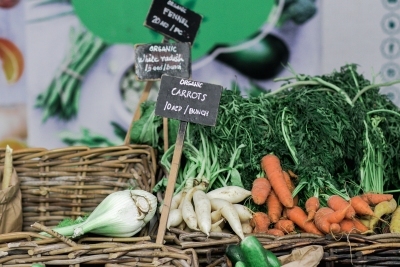 One question I am often asked by my clients, is whether organic food is really better for you? As a nutritionist, I strive to make the best possible choices about the things I put into my body including products that are free of chemicals and additives, and I encourage you to do the same. Here are a few things to consider before heading to the grocery store. Once you understand the meaning of the term, you are more likely to make an informed decision and feel good about it. However, it can be difficult to eat organic all the time, so instead, try eating locally and seasonally. This will help introduce a variety of foods into your diet, will be easier on the wallet, and you will be confident knowing that it has not been picked far from your home. Summer is a wonderful time to head out your local farmer’s market for fresh tasting food that will cut down on your carbon footprint, and help support your community. Or, you could try starting a small garden of your own, with easy to grow vegetables like peppers, lettuce, tomatoes, and beans. When it comes down to it, you need to feel good about the choices you make for your body, organic or not. « Is Kefir the New Yogurt?